Hello DIY slipcover makers! Today I want to share a few good resources for making your own box cushion covers. I know the thought of measuring, cutting and assembling all of those pieces — top, bottom, boxing panel, welt cord and, ugh, the dreaded zipper panel — stops you in your tracks. When I made my first boxed cover I felt like it took FOREVER. The corners didn’t line up, boxing pulled and seams puckered. But after following a good tutorial and making just one cover I got the hang of it. Below are my favorite cushion cover video tutorials. If you’re a visual learner like me I think you will find these super helpful. Practice a bit and have fun! You will be whipping out good fitting covers in no time. Sailrite’s video tutorial demonstrates how to use existing cushion covers as a pattern to make new covers. 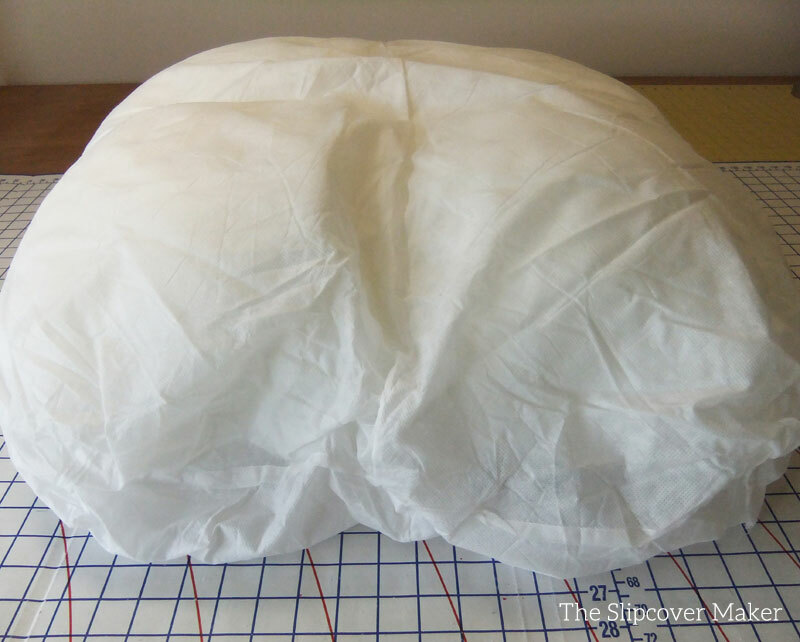 It walks you through how-to measure, cut and sew a cover for a T-shape box cushion and a partial box back cushion with cording and zipper opening. 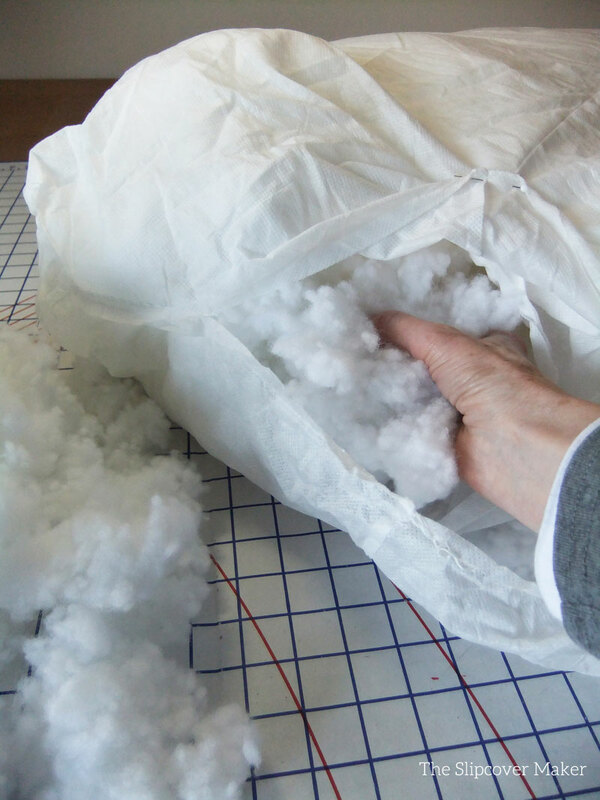 Their professional instruction also includes tips for trimming a foam insert, matching a print and adding stuffing to a back cushion. Follow Peg Baker’s video series for creating a basic box cushion with welt cord and a zipper. If you are a beginner sewer and new to to making a cushion cover I think you will appreciate her easy to follow step-by-step tutorials broken down into 10 videos. Kim’s Upholstery tutorial is a short video showing how she assembles the pieces for a box cushion. Her speedy method is commonly used in professional workrooms. Great for you advanced sewers who can manage the short cuts. 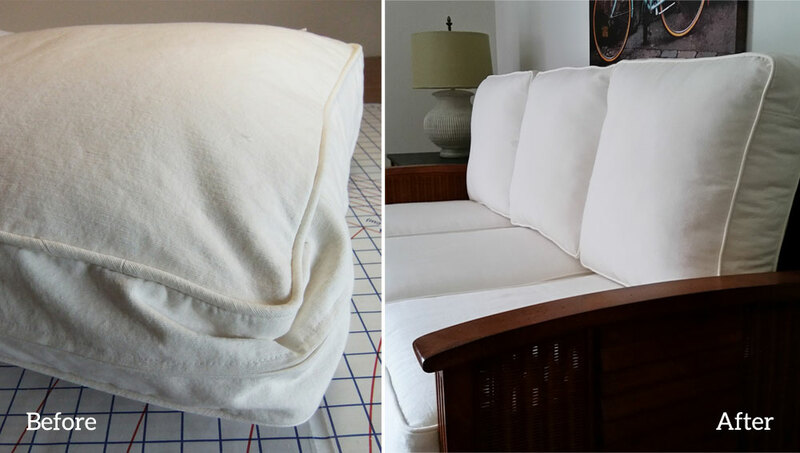 This entry was posted in cushion slipcovers, slipcover tutorials on July 29, 2018 by slipcovermaker. Back cushions on a sofa, or chair, lose their shape and support overtime. It’s a common problem especially on older furniture. The loose fill inserts compress, shift and get lumpy causing the covers to sag. Sound familiar? Step 1: Remove insert from cushion. Rip out seam at one end. When you open the insert you will see one or two baffles. A baffle is a divider that creates compartments for the loose fill. There is no foam piece in this type of back cushion. 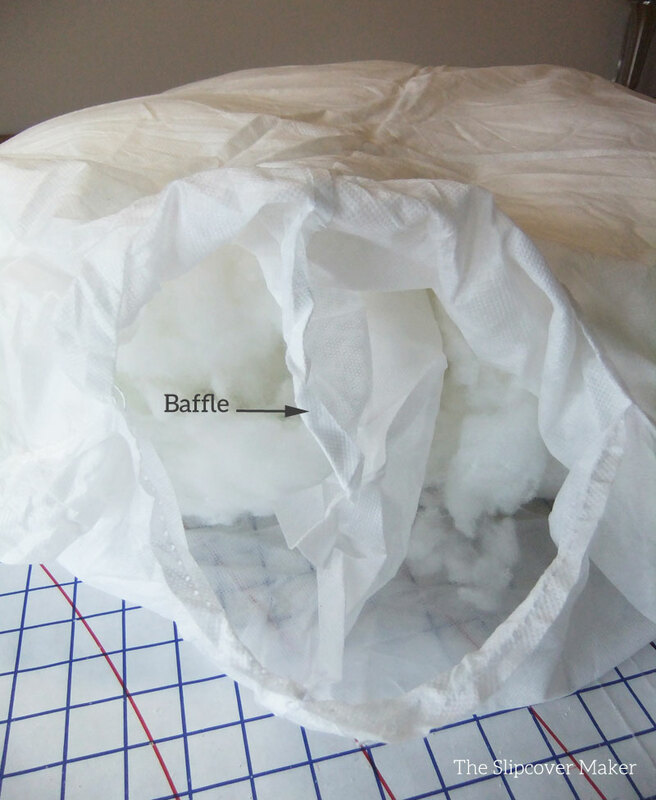 Step 2: Using polyester cluster fiber fill, stuff each compartment (on both sides of the baffle). The amount of fill will depend on the cushion size, level of compression and desired firmness. Example: for the 3 back cushions shown in the photo above I used a total of 4.5 pounds, which created fairly firm cushions. The poly cluster fill mixes well with other types of poly fill and feathers. It’s light and springy. I like it much better than poly batting. You don’t have to remove the old fill. Just add the new fill to the hollow areas. Make sure to stuff the fill into corners — that’s where most of the compression occurs. Step 3: Close insert by hand stitching along original seam line. Now it’s ready to slip it into the cover. TIP: The insert shell is cut larger than your cushion cover on purpose. Don’t pack in the fill too tight. When you’ve added your desired amount of fill the insert should feel fluffy, slightly dense and pliable. If your insert won’t fit back into your cushion cover you’ve over stuffed it and will need to remove the excess. This entry was posted in cushion slipcovers, slipcover tutorials on July 4, 2016 by slipcovermaker. 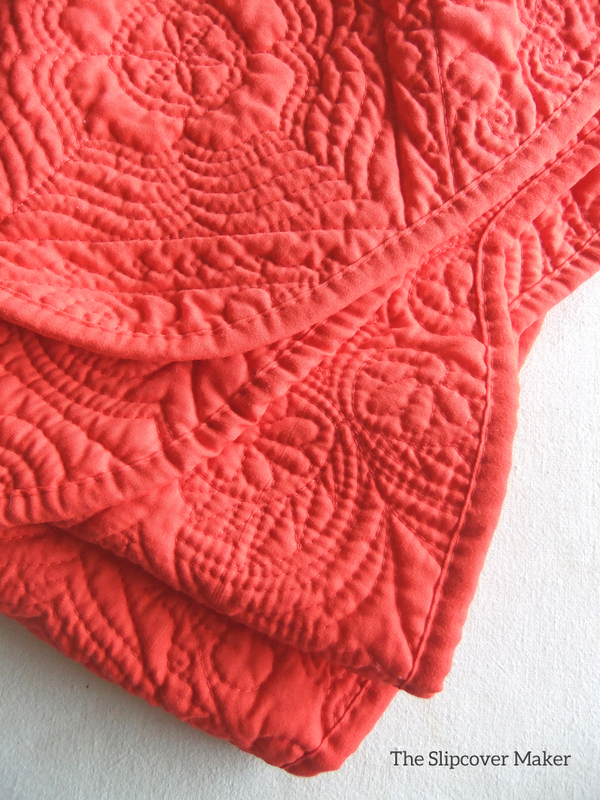 Another quilted cushion cover project. Trimmed in red canvas piping. So pretty! 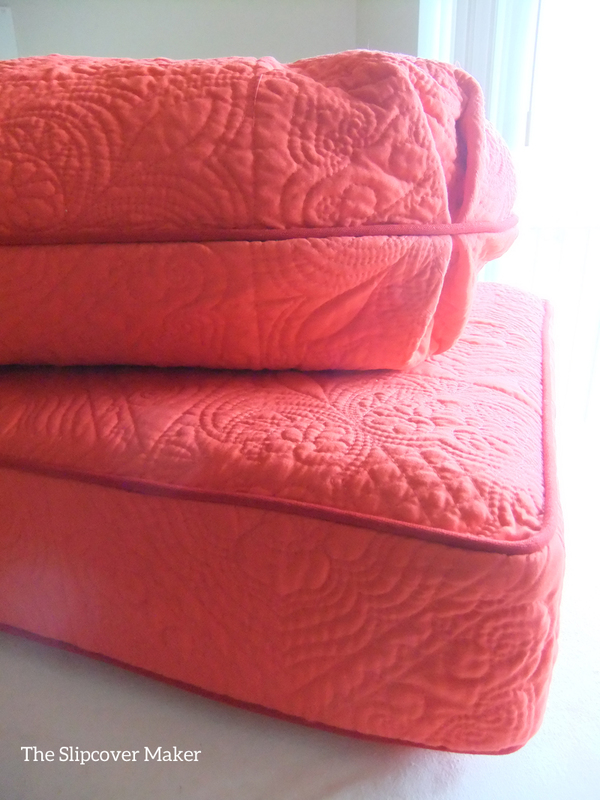 My customer found this happy orange coverlet at our local SteinMart store. This entry was posted in cushion slipcovers on June 14, 2015 by slipcovermaker.